Scientists in 2005 were only just starting to recognise the astonishing size reached by pterosaurs, those flying reptiles which lived alongside the dinosaurs of the Mesozoic era (248-65 million years ago). Recent discoveries in the Americas suggested that some had wingspans of eighteen metres (sixty feet). But there was nothing ugly about the way they moved through the air, according to Dr David Martill of the University of Portsmouth. Their ability to utilise air currents, thermals and ground effects would astonish aeroplane designers, according to him. 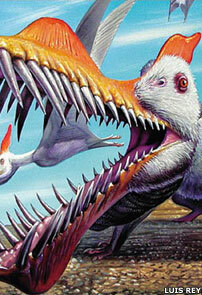 Pterosaurs were beautifully engineered. Their skeletons were exceedingly light: their bones were very thin and hollow, and those hollows were filled with an air-sack system. They had also lost their reptilian scales and their wing membrane was exceptionally thin. All of this meant that there wasn't that much weight to get off the ground, and so they probably flew really rather well. The oldest pterosaur fossils date back to 220 million years and by now scientists had identified several different forms - some with teeth, some without; and some sporting elaborate head crests. With their membranous wings attached to their legs there was something bat-like about them, and their long beaks were similar to those of some bird species - but scientists were stressing that they shared no line of descent to any creatures living now. Indeed, there was still a great deal of debate about where exactly they should be placed in the evolution of life forms on Earth. Dr Martill told the British Association's Festival of Science in Dublin that new discoveries would help to solve this riddle - and perhaps reveal just how big these beasts managed to grow. Pterosaur trackways found in Mexico not too long beforehand suggested that the animals could achieve a wingspan of eighteen metres. Existing Romanian and Brazilian fossils also showed a wingspan of between thirteen to fourteen metres (42-45 feet). Compare this to today's biggest flying bird, the wandering albatross, which has a wingspan of about 3.5m (11.5 feet). One of the reasons they were so big may have been because they just kept on growing. Humans get to their teenage years and then stop growing; but if a pterosaur kept on growing then the older it got, the bigger it got. They would be rare at their biggest size of course, because the older they would get, the more chance there was of them being eaten or being involved in an accident. There is evidence from rare fossil eggs containing pterosaur embryos which suggests that the creatures could fly soon after hatching. If this was the case then it was a remarkable achievement because the wings would have had to have grown from just a few tens of centimetres in length to several metres without interrupting the animals' flying capability. This would be something along the lines of an aircraft engineer trying to convert a Eurofighter into a jumbo jet while it was still flying.